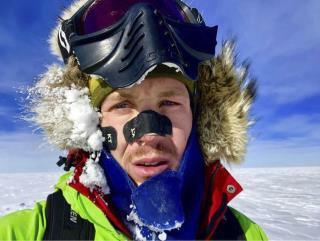 (Newser) – With a final, 32-hour push, American explorer Colin O'Brady has completed a journey seen as an "impossible first": a solo, unaided, 921-mile trek across Antarctica. "I did it!" the 33-year-old told his family in Portland, Ore., after finishing the journey in 54 days. O'Brady was racing to make it to the Ross Ice Shelf finish line before British adventurer Louis Rudd, who was making the journey in honor of his friend Henry Worsley, the AP reports. Worsley died in 2016 after attempting the feat and turning back just 30 miles from the end. O'Brady documented his amazing journey on his Instagram page. Let's give O'Brady the snowman award. Now go do some volunteering if he's that bored with his life. Crazy cool achievement. My hat is off to him!